In a blender or food processor, pulse graham crackers until a fine crumb. Transfer to a large bowl and add melted butter and brown sugar. Stir with a fork until well combined. Press half of this crumb mixture into the bottom of an 8×8 pan, sprayed with nonstick spray. In a stand mixer fitted with a whisk attachment, beat together cream cheese, sugar, and whipped topping until light and fluffy. Fold in blueberries. Spread on top of crust. 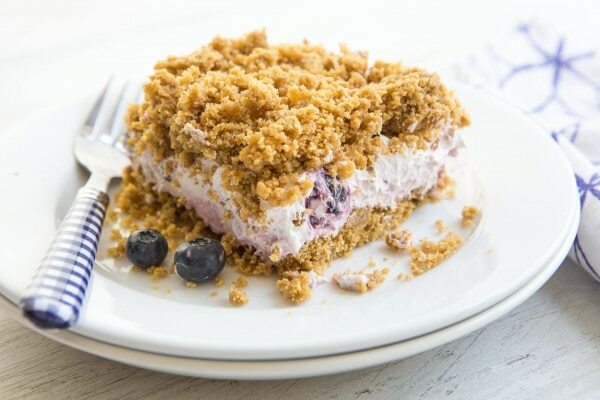 Sprinkle remaining graham cracker mixture on top and spread evenly across the blueberry filling. Freeze for 3-4 hours or overnight before serving.